In a medium sized bowl, add cooked Sweet Corn Kernels, finely chopped onions, tomatoes, 1/2 tsp Black Pepper Powder, 1/2 tsp Chilli Powder, 3/4 tsp Chaat Powder, 1/4tsp Black salt, 1/2 Tsp Chilli Flakes. Stir it up. Add a good squeeze of Lemon Juice. Chek for salt and add more if needed. Divide them between snack bowls / preserving jars. 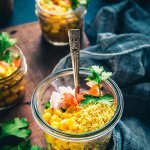 Top up Corn Chaat with Nylon Sev, coriander leaves and serve. Leave out the Chilli, if you are making them for kids..